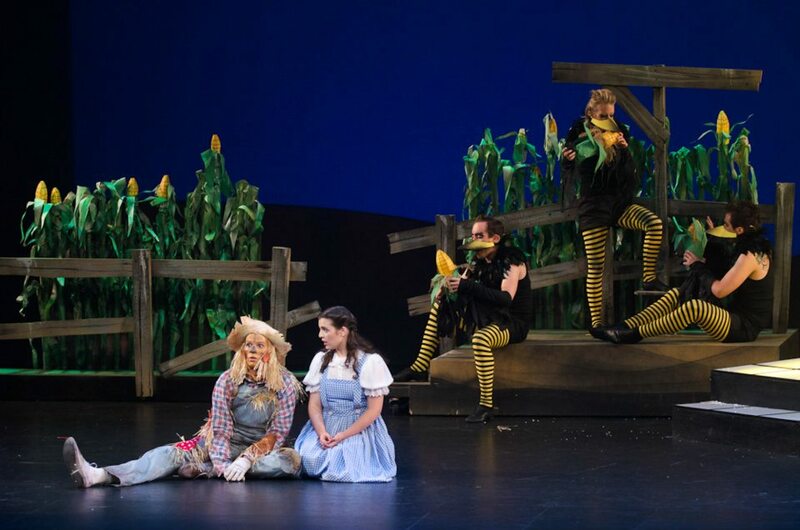 Tim O’Connor, CEO & Artistic Director of Harvest Rain Theatre Company and Director of their latest musical, The Wizard of Oz, wanted more than anything else, to put the classic (1939) film on the Playhouse stage. And I think he’s done it. This is a glorious production, of considerable scale, which far surpasses anything I’ve seen staged by Harvest Rain. I’ve noted previously that family entertainment is this company’s specialty and in this production we have it in abundance. The ideal choice for this group, showcasing all their strengths, O’Connor has assembled superb leads, a fabulous ensemble and an adorable children’s chorus. And then of course there’s the creative team, who have finally found a way to get the creative juices flowing in the same direction. Even more impressive is that I attended the final preview performance before opening night. It was the slickest preview EVER. When a company’s history is a little hit and miss, and I’ve always been honest about their misses, I’ve gottta lay on the love when they get it right. So here’s a whole lotta love for a large-scale musical production that you really shouldn’t miss. Over the years, Harvest Rain’s has become a tight-knit little creative team. They used to not play so well together and we would see conflicting or unfinished ideas instead of a completed, melded and polished product. Now I wouldn’t dream of separating them. A couple of them come and go (they are regularly invited to play with the big boys) and the experience must be informing what they’re doing when they return to Harvest Rain to work. The Wizard of Oz, based on Frank L. Baum’s book, with music and lyrics based on the MGM motion picture score by Harold Arlen and E.Y. Harburg (background music by Herbert Stothart) and adapted by John Kane for the Royal Shakespeare Company, is truly timeless. 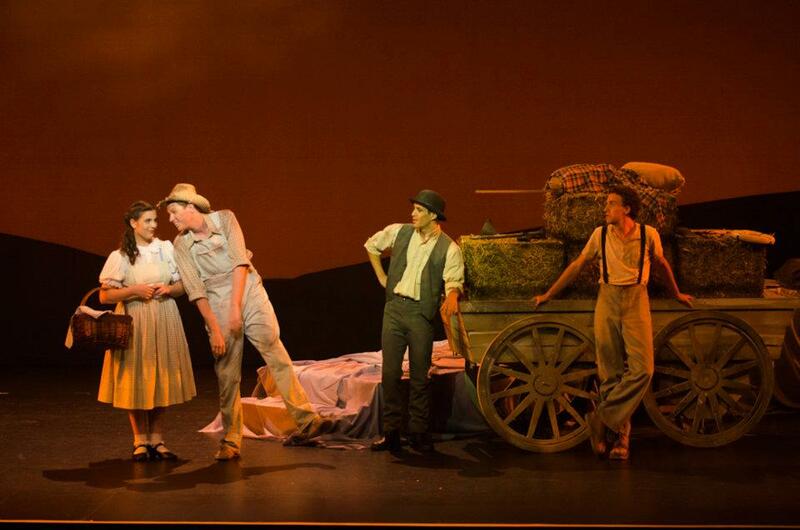 O’Connor has imbued this production with his long-held love for the story, its characters and for that place beyond the rainbow. McIntosh has designed starkly contrasting sets, complemented by Glenwright’s evocative lighting. The mood is set before we see any of it with the orchestra’s stirring overture. Under the competent baton of MD Drew, this old-school opening allows us to sit back and see our own images, our own memories of the much-loved film. Paired with the full sound of the orchestra, the vocal arrangements make this a nostalgic experience for the young at heart before the curtain is up. It opens on the dreary, dusty hues of the Gale family’s Kansas farm (remember the first time you saw The Wizard of Oz and tried to fix the colour on the TV?) Far from the dull daily chores of rural life in Kansas, we are taken on a trip through a strange, strobe-lit twister moment; it’s a rather long one and it’s the only questionable moment in the entire show, all enormous flag waving, which doesn’t really work, however, I could feel that others in the audience, including the five year old, Poppy, enjoyed it, in an anticipatory, storm-comin’ kinda way. 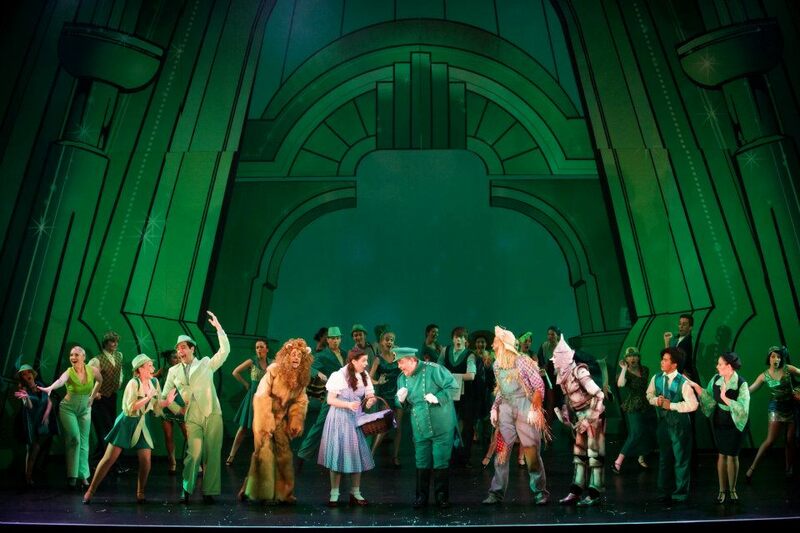 We are taken, with Dorothy Gale and little Toto (too cute) to a place beyond the rainbow and into Munchinland, complete with painted houses and the adorable children’s chorus as the inhabitants. The children do a terrific job as Munchkins. They are well rehearsed and present themselves confidently and professionally. And suddenly, it’s in Technicolor that we feel the show starts. Dana Musil warms on me and I try to ignore that somebody must have told her to be as Garland as she likes. It works for the singing (her singing is gorgeous) but not so much for her spoken lines, which might be lost at times to those unfamiliar with the script. I appreciate the efforts towards achieving a certain level of authenticity within the context but I need to hear clear speech. 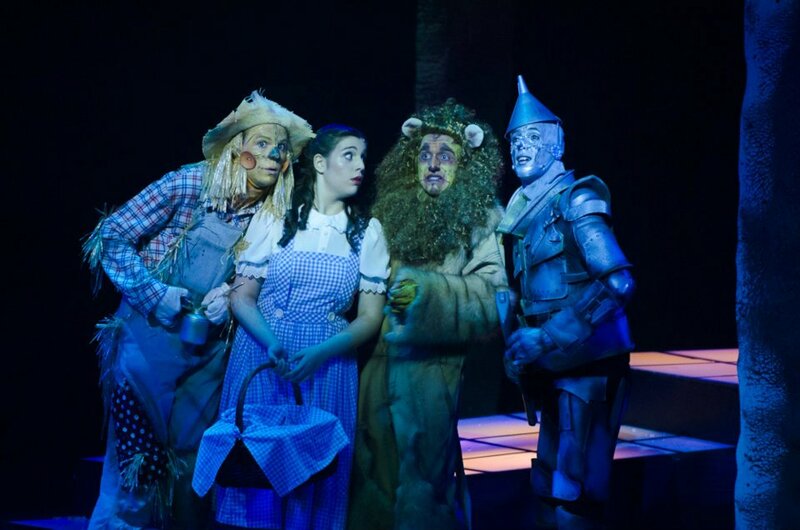 And, having noted the efforts towards “authenticity”, I would love to have seen an original take on Dorothy, as we saw with the travelling companions. We’ll get to them in a minute. Angela Harding is a beautiful Glinda and presents as a possible Galinda, should the opportunity arise. The woman is versatile and I look forward to seeing her solo show later this year. Her antithesis and Dorothy’s nemesis, the Wicked Witch of the West, is Penny Farrow at her most diabolical. Maniacal cackles, well-timed one-liners and beautiful big movement give this witch the right balance of nasty and comedy. 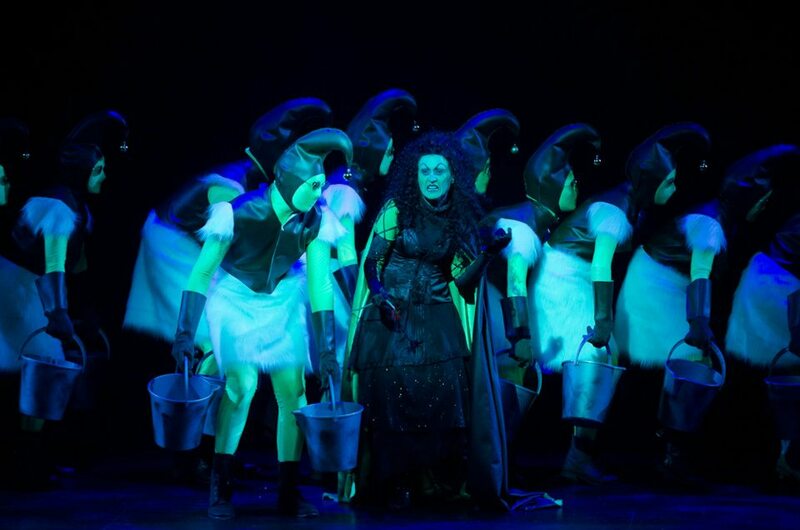 Having seen Wicked, Poppy reminded me that the green witch is not as nasty as everybody thinks but is misunderstood. She has been teased for so long that sometimes she just can’t help how she responds to people. Also, she doesn’t melt and die; she’s living with Fiyero in the field under the stage. For young Wicked fans, this show is indeed a sequel. I hope for HR’s sake, the newcomers (and by newcomers I mean newcomers to HR, not to the stage), Dan Venz (the tap dancing, debonair Tinman) and Matty Johnson (Lion) have signed a contract to stay – or at least to return whenever required – because these guys give wonderful performances that have helped to raise the standard of the show overall. 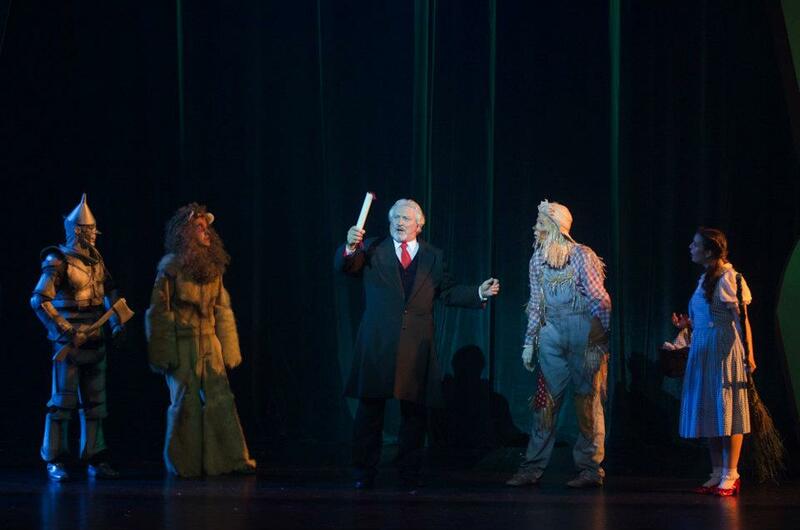 If I Were King of the Forest is a song that, in the film, is misplaced and so slow I would rather skip it but Johnson performs it with a sassy Rum Tum Tugger type attitude to suit any cabaret club or morning television show (somebody tell DC)! He’s no Ray Bolger but Shaun Kolman is a delightful scarecrow, bringing lightness and tenderness to the character’s comedy and choreography. Steven Tandy is the wonderful Wizard of Oz and on stage, he certainly lives up to his character’s reputation, giving us a wonderful combination of emotions as the wise, lost man who is so very loved in a place he can’t call home. It’s a touching performance from one of our favourite Brisbane actor/directors. I’m enjoying working with Mr Tandy in Noosa, on David Williamson’s Travelling North, which opens in April. Special mention must go to Grant Couchman, who is a firm Uncle Henry to Kathryn Dunstan’s gentle-ish Aunt Em. It’s as the Guard at the gate of the Emerald City that we enjoy Couchman’s easy comic ability and his is another performance you can look forward to. With spot on vocals and energetic dance numbers, the 25 strong ensemble provides additional colour, energy and laughs. They are, thanks to McIntosh and a sizeable costume construction team, superbly dressed. In a scene that need only incorporate a sweeping staircase to be mistaken for the Folies Begere, we get a hint of the high fashion to come, admiring Dior inspired hats and reversible opera cloaks before getting the full picture, which is very Vogue indeed, inside the walls of the gloriously lit Emerald City. 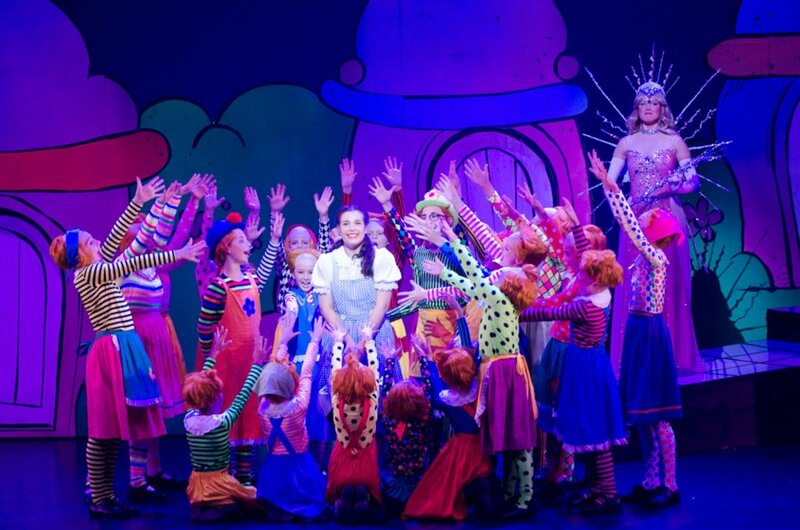 The Wizard of Oz is a spectacular show that doesn’t disappoint and importantly for me, it’s the show that has earned Harvest Rain their place in the Playhouse. If you’ve not been a HR supporter before now, expect to be converted. Xanthe must have seen a very different show to what I did. I saw a lack lusture performance, with lead characters that were out of tune, ensemble members that were out of time, far too many sound problems, and as for the set. What on earth were harvest Rain thinking with the Muchkin Village looking like a packet of giant condoms. 1. Harvest Rain – Jesus Christ Superstar. (I am a Harvest Rain hate, but rate this as number one). It is a personal choice to what people like, I just did not like this production, in m any ways, just like how a number of the shows I mentioned above, you did not like. The one thing I will tell you, I do not hate any theatre group, and I see a show just about every week. Oh my God I love that I am a huge Wizard of Oz fan my name is Trevor by the way I have probably every cartoon ever made I seen every version including the Turkish. Lol even though I did not know what they were saying I still knew the storyline. The only live one I seen was the Fox Theater in Detroit I love it I ordered the Andrew Lloyd Webber DVD and I’m trying to find the Madison Square Garden one right now but I can’t find it anywhere what this happened to be on tape or would you have the whole show I would love to see you at our purchase at please let me know that would be awesome.